My last few articles about Basic Income almost wrote themselves… a sign to me (as a dense, carnal, keyboard interface for some mysterious inner lightscribe whom I’ve never gotten to know or understand very well) that Basic Income is a vital concept begging to heal the world. Of all the solutions out there, it’s certainly my number-one pick to fix America. My second pick? Restoring a tarnished American reputation. After World War II, America seemed poised to usher in a new golden age of moral integrity, innovation, international support, and good will… joining with other countries to forge the United Nations, giving foreign aid to poor countries, spreading truth through an interpretive, investigative media… and then something shifted. Among the most corrupt. According to a recent article citing Voice of America statistics (which in turn are based on a Transparency International survey), the USA today has become one of the most corrupt countries in the world in at least 10 ways… not so much because Americans are more corruptible than anyone else, but because we have ample wealth that attracts ample corruption in tenuous economic times. Between political bribery and private lobbying, deregulation of banks, a bloated military budget, swelling private prisons, NSA spying, billionaire-controlled bias in the media, and other factors, the USA stands out in the sheer magnitude of its corruption. Biggest threat to peace. Today the USA is regarded by the rest of the world as the greatest single threat to world peace, according to a recent Win/Gallup international survey. In any event, there’s plenty of evidence (similar to the articles mentioned above) to suggest that fixing America will involve restoring its reputation in the world community. covert government operations that uproot foreign regimes, reduce societies to a shambles, and generally spread fear, anguish, and destruction (the Military-Industrial Complex)…. This could turn into a book, and I don’t have time to write a book this morning… so I’ll zoom in on what I think is far and away the biggest cause of America’s tarnished reputation: the last item on the list. Defusing the Military-Industrial Complex, which spreads fear and destruction around the world, would probably be the biggest single step toward restoring a good reputation. America’s military-industrial complex spins out of a relationship between the government, the military, and the industries that develop weapons and otherwise support the military. It grows out of a fear that we live in a hostile world and we need to protect ourselves. Being fear-based, MIC has evolved into something more insidious than that. The military has become a tool of business and industry to browbeat other countries into submission… modifying their governments to be America-friendly and serving up their resources to hungry US industries. The glaring example today is the oil-rich Middle East being churned by chaos. MIC involvement in the Middle East has grown steadily since World War I (read more… ) and reached a climax with the destruction of Baghdad by the Bush Administration and its links to the oil industry—a major component of today’s Military-Industrial Complex. 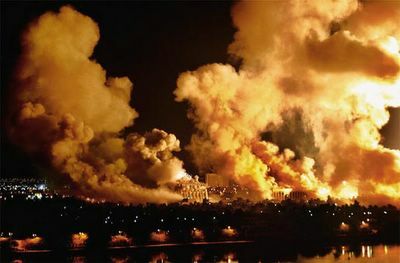 America’s thirst for oil gave MIC the impetus to unleash “shock and awe” on Baghdad in 2003. There couldn’t be a more fitting moniker for MIC today than “Shock and Awe,” a term that implies and incites the ultimate sense of fear. So, how can we start turning things around? 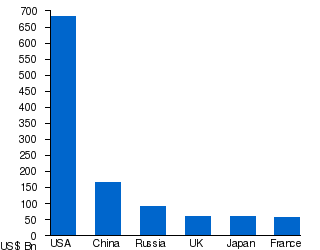 Currently the US spends more than any other country for military purposes. In 2012 the US spent about $666 billion on the military, a hell of a number. Cut US military spending by two-thirds, and you’ll still be spending more than any other country in the world. And use that savings to help pay off the national debt and to kick-start a Basic Income program. It’s not that difficult, folks. 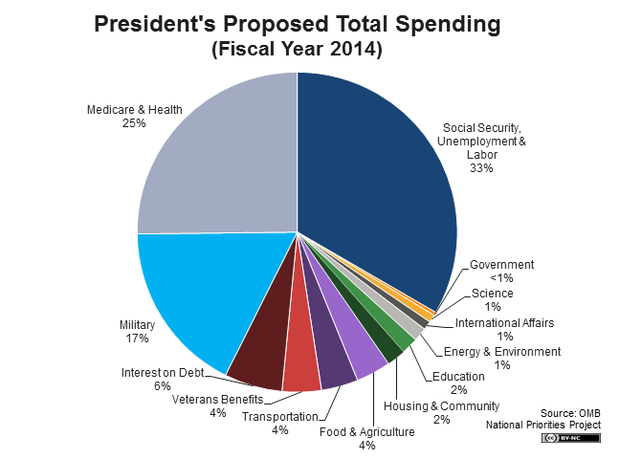 Trim the sky-blue pie piece in Mr Obama’s spending chart from 17 percent to just 5 or 6 percent. Otherwise, the fear and testosterone that feeds MIC could start boiling over into something really ugly and bizarre. One of the freaks that’s spun out of MIC is a million-dollar monster truck called “MaxxPro,” developed for fighting in the Middle East. It’s probably not suited for soccer moms, but as the Pentagon leaves Afghanistan it now has several thousand of these beasts sitting idle… and it’s giving them away… not just to countries like Slovakia, but to cops of Madison WI, Watertown NY, Bastrop TX, the Ohio State University campus… anyone who can pay shipping costs and justify a need. 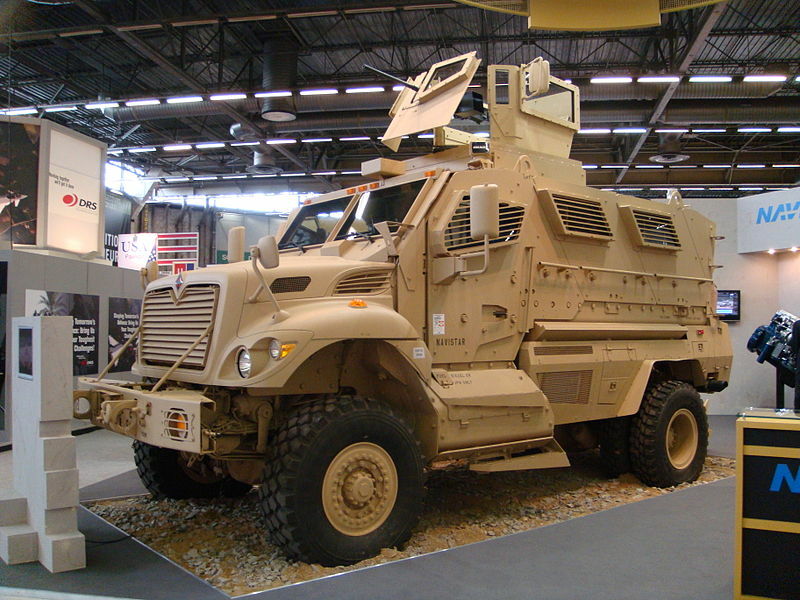 The whole idea behind Maxx (also called MRAP) sounds kind of idiotic to some people. The people who make up the Military-Industrial Complex are not idiots… but fear makes people do idiotic things… such as paying billions of dollars for useless supertrucks… making stupid decisions for which they get a bad reputation… such as being called chicken-hawks—frightened men who strut and crow and break things to disavow their fears and to overcompensate for their weaknesses…. Case in point: recently retired Defense Secretary Robert Gates, who pushed for a perpetual military presence in the Middle East and the proliferation of Maxx-Pro… and who will probably be remembered as a poster child for MIC tomfoolery. Cutting the budget of the US military will be one huge step to ameliorating the fear that makes MIC the crazy guy that he is… and it will be one huge step toward restoring America’s good reputation. This entry was posted in Politics and Economics and tagged anti-heroes, maxxpro, military-industrial complex, mrap, ugly american, US biggest threat to peace, US reputation. Bookmark the permalink. I was just writing to a friend back in my home town yesterday about just one aspect of this very issue; the Huge Problem called the MIC. I’ll send this excellent, and provocative, and entirely realistic posting to him. The MIC is destroying people and cultures, maiming lives, degrading the consciousness of all of our society via its propagandized celebration of violence, bankrupting our country, creating a horrible reputation for America such that I am shamed in my being, and not just fraying the edges of our moral fabric; it is carrying on with ripping it asunder into irreparable shards. I often say, “What if Monsanto took all its currently destructive creative genius and reoriented that genius toward methods that would save the planet and humanity and assist peace on earth?” Can one even imagine this possibility? What if our bloated and crazed MIC were reeled in to 5% of the budget, as you rightly and compassionately suggest? What if we reeled in our unnecessary hundreds of foreign outposts, brought all of the people and infrastructure home, put them to other uses, and redirected the human energy and the funds to foster real history and education and other vital programs to rebuild all of the programs to serve our society and the world? If we did that, it would serve world peace. Our CIA and the Israeli Mossad helped to create an illusion of the so-called terrorists. Now we have fostered and enabled a self perpetuating horde of terrorists by ongoing participation in this preposterous codependent co-creation of terrorism. I believe that if we continue to propagandize sanitized versions of history, and if we do not start teaching history correctly, then we will only see more of the same. We absolutely need to overhaul our education system into one which will save the planet, and our human culture, and the whole organism called Gaia by some. The Frankenstein monster which the MIC currently is was created by the build-up during WWII. Eisenhower warned us not to allow this monster to get up off of the lab table and start walking around the planet with its own self directed mandates. Unfortunately, it did get off of the lab table, and is imperialistically sacking and laying waste to cultures all over the globe. This same type of imperialistic campaign ended in the fall of the Roman empire and the British empire. However, these 2 empires did not possess the weaponry for annihilation which our MIC possesses. We the People need to get educated and assist some form of non violent reform before a violent reform takes hold and holds forth. Hi John, as usual I agree with you completely. Here’s a retired Army general who felt the same way… even before MIC Frankenstein was put together.